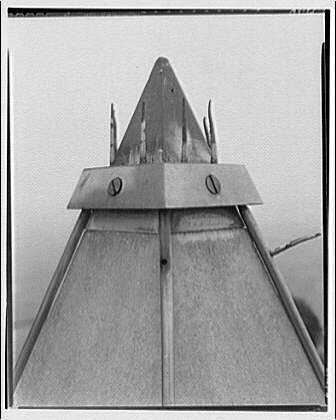 “Washington Monument repair and theft of lightning rod points,” Histories of the National Mall, accessed April 23, 2019, http://mallhistory.org/items/show/452. During the fall and winter months of 1934, the Washington Monument was prepped for repairs and cleaning, due to cracking at the base. Scaffolding was built around the 550-foot monument to allow the workers to make the repairs with Public Works Administration funding. The restoration lasted 140 days, during which time the Monument remained open to visitors. However, on December 28th, 1934, someone scaled the scaffolding to remove 107 of the 170 gold-plated, platinum-tipped lightning rod points from the top of the monument. The points were valued at $8 each, which totaled $856.